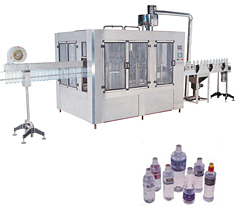 1) Designed with bottle rinsing, filling and capping multiple functions. 2) To be used kinds of non-air drinks such as mineral water, pure water, distilled water, wine, fruit juice and tea, as well as oil and vinegar. 3) Of unique design, new style, multi-purpose, easy operation, beautiful construction and automation. 4) Made according to customers' bottle samples and requirements. © 2011 Calmus Machinery, a division of Brentorma Electricals (Shenzhen) Co. Ltd.